Exactly a week from now, One Charming Day will turn 1 year old. Woohooo!!! I still can’t believe it has been almost a year since I first started this blog and I feel so happy to see how much my little blog has grown. As my way of saying thanks and giving back, I have teamed up with amazing event suppliers to give you this BIG Blog Anniversary Giveaway! We’re making the mechanics really simple. All you need to do is LIKE our Facebook Pages, SHARE the giveaway poster on Facebook, and COMMENT on this blog post. Very easy, right? LIKE, SHARE, COMMENT and get a chance to WIN! I’ll be doing the giveaway via Rafflecopter to make monitoring of entries easier. Please read on to learn more about the prizes and mechanics on how to join. This giveaway is open to Philippine residents within Metro Manila and nearby provinces only. To qualify, you must have an event (birthday, baptism, dedication, etc) within the months of May – September 2014. The giveaway begins March 24, 2014 and ends April 4, 2014 (11:59 PM Philippine Time). 3 winners will be selected randomly by Random.org via Rafflecopter.com on April 5, 2014. Winners will be notified via email so please enter a valid email address. When ‘LIKING’ Facebook pages, make sure you have clicked on the ‘LIKE’ button before clicking on “I’m a Fan” in the Rafflecopter form. Also, please make sure you have shared the photo and have commented on this blog post for your entry to be considered valid. You may share the giveaway poster via Rafflecopter for as many times as you like! More shares = more entries! For Prize A: shoot location should be within Metro Manila. Should the winner prefer an out of town shoot, winner must shoulder transportation and out of town fees. Photo shoot date should be scheduled on WEEKDAYS only and will depend on the availability of the photographer and shoot stylist. For Prize B: Cake will be designed according to theme. Free delivery and pick-up if within Mandaluyong, otherwise winner pays for the delivery fee. 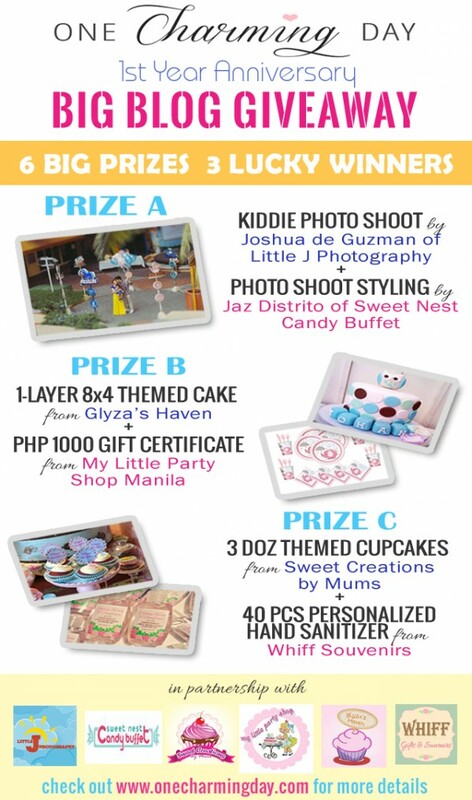 Gift Certificate from My Little Party Shop Manila will be sent via email. For Prize C: Cupcakes will be designed according to theme. Pick-up location is withing Mandaluyong. For the personalized hand sanitizer, each will have a personalized label designed according to theme. Pick-up is in Megamall otherwise, delivery fees will be shouldered by winner. Winners will be announced on April 5, 2014 and will be notified directly via email. Winners will be given 3 days to respond before a new winner is selected in a random drawing from all remaining eligible entries received. Names and email will not be shared with anyone. Names and email will be used only for the purpose of contacting the winner. Hi,!!!!! thank you for this wonderful giveaway!!! More power! My daughter is turning 2 this July24! Hope to be selected as one of the winners! This is amazing! Crossing my fingers for my baby’s birthday! Hi! Ask ko lng if for kids lng yung Giveaway? Thank you! hi I just joined the contest and entered the details in my previous post, i made an error with my daughter’s birthday. I meant to type 12/12/14 instead i typed her actual birthday. thanks. Date of Event: September 17 or 20.
the event will be my son & nephews bday celebration. they all are turning 14 y/o and we decided to give them a 3 in 1 bday/swimming party . this is like a turning to teener party for them and it would be very exciting to have a marvelous give aways coming from you. That would be like a blast! they love spiderman, cars (matchbox thing) but my other nepher doesn’t prefer anything. I hope we would be picked on this bonanza sweet!! !